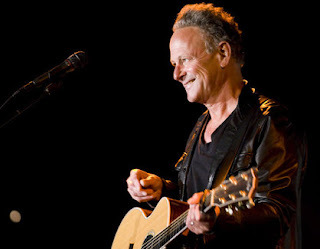 Former Fleetwood Mac singer inaugurates SLO Brewing Co.’s concert series for the movie theater with one-man acoustic show. No Dancing... and were back to the leather jacket. By looking at the setlist provided by Majesticentinc, nothing has been added. 13 tunes... nice set, but a bit slim. Um, sorry but NOT "TO" LATE should read NOT "TOO" LATE. Correct this now!!! Lindsey, please change things up a bit from night to night! I'm catching you four times on the east coast and would love variation in the setlists. You're a genius, and I know you can do it. 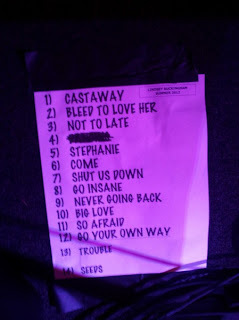 Is there a "Stevie" theme in his set list? Stephanie made him come, joining fleetwood mac shut us down, and made him go insane, so he's never going back again to that big love. Yeah He was so afraid for them to go your own way bu the didn't want trouble. And all of this is the seeds WE sow, SLN!